Here’s a simply superb recipe for how to lose a customer for life. Step 1: Misrepresent your offering. I needed to book a hotel on Hotwire. I picked a 4-star blind booking because I didn’t care which hotel, I just wanted any nice hotel. See the word “hotel” appearing twice on this screen. They booked me into a condo. 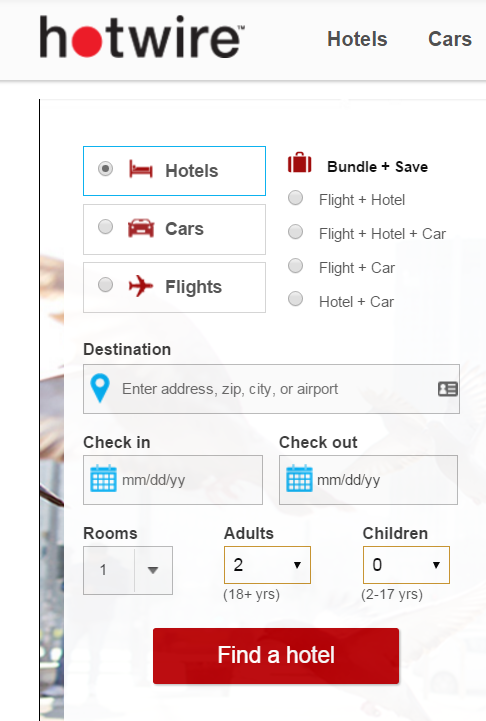 But I wanted a hotel — I’m not on Airbnb, I’m on Hotwire and I pressed a button called hotel. I don’t want someone’s condo. I want a hotel and what’s associated with it — e.g., 24-hour reception, a bar, a restaurant, lobby, etc. I’m already unhappy and the story’s just beginning. 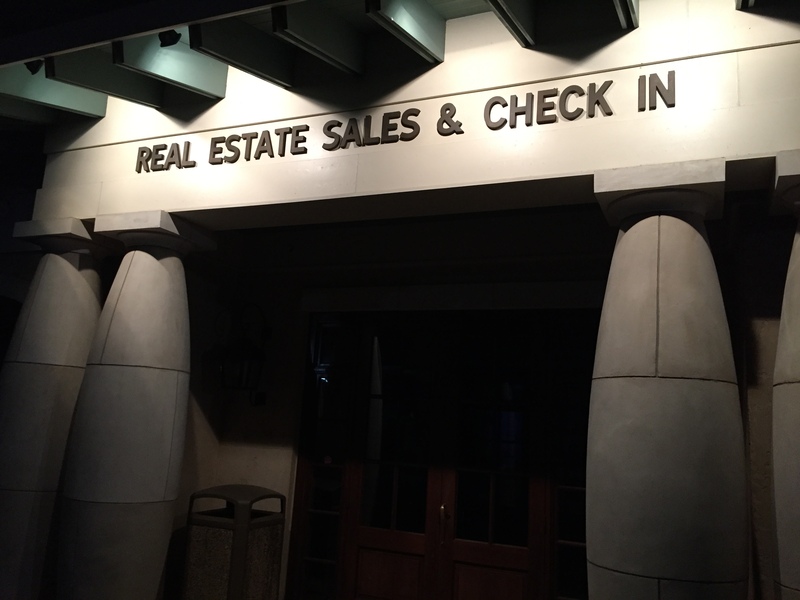 I drove to the condo complex and my worst fears were realized. There’s nothing hotel-ish about it. It’s a series of residential towers. No lobby, no restaurant, no bar, no life. Heck, I had to struggle to find the check-in area. 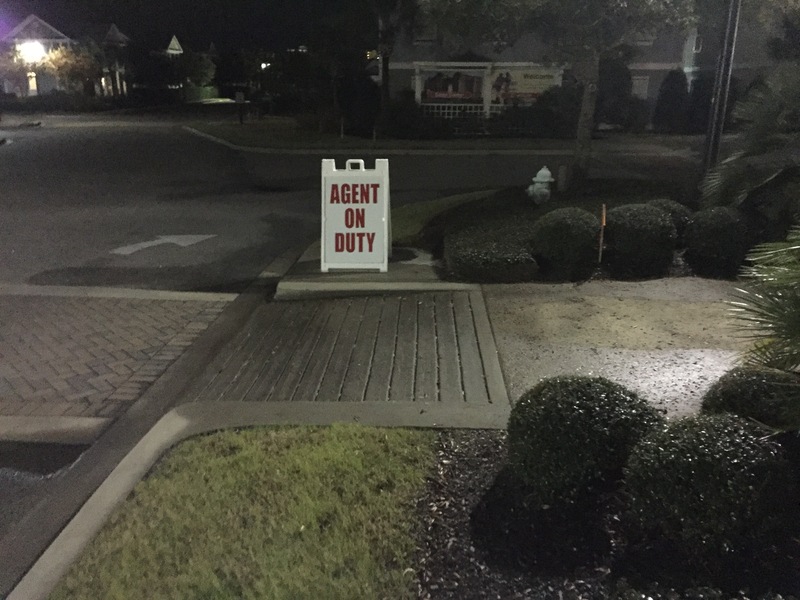 I found an “agent on duty” sign but the check-in area was closed. No worries, I called the number for the property listed on my reservation, twice, but got no answer. I waited 15 minutes to see if anyone shows up. No luck. So I booked another hotel (not via Hotwire) and stayed there instead. I emailed Hotwire requesting a refund because I was unable to access the property because the check-in area was closed and the property didn’t answer the phone. Hotwire responded saying the property told them they have a 24-hour desk with security who will check people in. I replied that was funny because I was there and I can tell you that they didn’t. I mailed them pictures of the “agent on duty” sign and closed check-in area. I reminded them that I called the number listed for the property twice and no one answered. I also reminded them if they booked me into a hotel — as the screen said — and not a condo, then they would have had 24-hour reception and I’d never have had this problem in first place. They refuse to do anything. I don’t give up. The world’s not perfect; I run a business — problems happen, it’s how you respond to them that really counts and I know we’re going to need to escalate beyond first-line support to get a refund. I wrote again. I asked my poor assistant to call them. She was kept on hold for an hour, hung up on, call dropped. Again, they refused to do anything. Because the facts are so stark, I’m confident I’m going to win eventually and continue to use Hotwire during the ongoing dispute. You recognize that I was unable to stay at the property because no one was there to let me in. This is not a satisfaction issue, this a a non-delivery of service issue. You regret my frustration and you want to thank me for my feedback — I’m not giving feedback, I’m demanding a refund for breach of contract. Going forward, I’m not sure what I’ll do. I think I’ll follow the ideas suggested in this post, which I wish I found a few months ago, such as complaining to the credit card company and reporting them to the Better Business Bureau. But that’s not the point of this post, which is about customer experience. Hotwire, think for a second. What other response than “goodbye forever” could a customer possibly have to your email? I’m not new to customer relationship management (CRM), customer loyalty à la Fred Reichheld, or customer experience management (CXM) as it is now more recently and holistically labeled. I spent a lot of time working on CRM from the business intelligence (BI) angle during my near-decade running marketing at Business Objects. Recently, I was general manager of customer service applications at Salesforce.com. I’m also not new to France. I’m an admitted Francophile, have lived in France for five years, and helped build one of — if not the — most successful enterprise software company in France. I am thus quite familiar with French customer service where the problem is not that the experience is never good – some of the best customer experiences of my life have been in France — but rather that it’s highly bi-modal  and resists industrialization. This post began life entitled “The Ten Reasons I Will Never Fly Air France Again.” But the passage of time, the realization of a lack of alternatives on the SFO/CDG route, and a diving catch by the Air France Twitter Support Team, caused me to change it. Nevertheless, it stems from a horrific experience I had this summer with our return flights from Corsica . Instead of dwelling on the idiocy of the entire experience or its parts, I will attempt instead to extract lessons from it. Details will be dumped to footnotes. All customer interactions are moments of truth which combine to shapes the ultimate experience. During very many of these moments of truth Air France failed and failed badly. Let us now try to learn from their errors. Let’s now drill into each of these with more detail and specific examples, the most outrageous of which earn a #Kafka tag for the circular torture to which the customer is exposed. Air France showed major operational seams not only with their partner Delta but also with their own US operations. Never, ever attempt to convince me that somehow my problem is because I bought my ticket on www.airfrance.us instead of www.airfrance.fr. When I call the (US) 800 number listed on your website, do not answer the phone “Delta/Air France.” You know what number I called. Answer the phone accordingly. As we suffered through this experience, I realized that most of the time we spent talking to call center agents was spent with giving us increasingly detailed and often different explanations – all buzz-speak laden – as to why they couldn’t fix our problem. I don’t care who issued my ticket. I don’t care if my ticket needs to be re-issued. I don’t know what issuing a ticket means. Therefore I don’t care if the original agent making an issuing (or is it issuance) error is the root cause of the problem. I don’t actually care what the root cause of the problem is. I simply want you to tell me that I can fly on the flight on which I purchased my ticket and on which you had confirmed me multiple times. Please imagine the Who’s on First discussions this then drives between customers and agents. The second inane policy is an oldie-but-goodie. Air France, has for decades at this point, had a “business” or premium economy seat within Europe that exactly the same as a regular economy seat. No extra width . No extra legroom. No ability to advance-reserve seats. And I believe (and certainly on our flights), no difference in food or beverage . Airlines can get too wrapped up on miles / flight frequency as a measure of loyalty and value. I believe yet another root cause for our troubles is that I am currently a low-frequency (i.e., bottom tier) frequent flyer on Air France. Let’s do some math to illustrate my point. Hypothetically, let’s say I make the decision and buy tickets for 6 people who travel to France every other year on $4500 discounted business class tickets. That’s $27K every two years or $13.5K/year. Let’s say Pierre travels for a small business, is careful about his fares, and flies 8x/year to SFO at an average of $1.5K/ticket. Pierre is logging 88,000 miles/year on Air France and paying then $12K. I am logging 2750 miles/year and paying $13.5K. Pierre is a probably a penultimate tier flyer and treated pretty well. I am treated like junk. Yet, are we that different? Who is, in fact, more valuable? Because these can be hard to measure (e.g., decision maker) we tend to not measure them. But I can assure you that in two years someone will be making the airline decision for the bi-annual France trip. Just because identifying the decision maker is difficult, doesn’t mean that there isn’t one or that he/she doesn’t matter. This one is simple, yet broken with stunning frequency. Here’s the rule: if you’re ready to charge me for something when I take it, then you need to be equally ready to return my money if you take it back. I mentioned this already in the context of Air France silently downgrading us from premium economy. United did the same thing to my wife recently. She is a bottom-tier United flyer, but had paid extra for a specific seat, paying something like $68 extra for a bulkhead only to find when she was about to board that someone else had been given her seat. (I suspect because they were high-tier frequent flyer.) They moved her back one row, without her consent, just handing her a new boarding pass. But the seat they moved her to cost only an extra $30, and nary a mention was made of the $38 difference. That’s garbage. If you want to charge for something we a customer takes it, you need to pay them if and when you take it back. As customer experience consultant Shaun Smith likes to say, “customer loyalty programs don’t generate customer loyalty.” What they do generate is a lot of system-gaming and one-dimensional customer evaluation. I remember shortly after I moved to Paris many years ago, I had a full-fare business class ticket from Paris to Tokyo on Air France. When I tried to check-in they said they were going to downgrade me to economy because I was the least frequent flyer in business class. People who historically score poorly on that variable are treated poorly, creating a huge disincentive to join the system. People who score well on that variable are treated well and quickly develop a sense of entitlement, creating inflated expectations that are difficult to meet. Frankly, I liked Virgin America a lot more before they had their frequent flyer program because they used to treat everyone well. Now, they’re discriminating like everybody else. As we endured our nightmare, after many argumentative exchanges, the agents with whom we spoke eventually determined that the person who put us back on the earlier flight had made an error in somehow not properly re-issuing our tickets. So, while they were not quick admit error by any means, they eventually did. However, what happened next was appalling. The prior sentence is one that should never be said in your call center. If you know the mistake is on your side, then you must do something to fix it. Period. Always. Only when dealing with the French call center — where it customary to pay high telecom fees to be connected — did the agent show sensitivity to our costs, offering to call us back instead of putting on hold. Thank you for that. Companies/agents should do it more. It’s well known that both agents and customers are happier when agents are empowered to fix problems. By my math, our problem could have been fixed for about 300 Euros ($420), assuming they’d have to bump/compensate two people to the later flight in order to honor our committed reservations. That could have been done on a volunteer basis so the recipient would be definitionally happy. We would have been happy. Everyone would have been happy. Instead, we spent $300 on phone connection fees. Air France spent 5 hours worth of agent time, call that $300 more. Air France had to then buy 4 tickets on another airline, call that $800. In addition, the Air France social media team had to deal with me and my tweets (and delete my post off their Facebook wall). All in, Air France spent $1100, we spent $300 and nobody was happy. And they might well have lost a customer for life. Perhaps you can’t empower every agent to re-book people onto their original but now sold-out flights. But you can empower your supervisors. Otherwise, all your agents can do is say no and explain why they can’t fix problems. One of the important parts of the social enterprise message at Salesforce.com is reflected in the Jeff Bezos quote above. It’s a key reasons why people also say things like “service is the new marketing.” The fact is, in a social media world, when people are unhappy they can tell lots of other people very quickly — and that’s precisely what I did, both as a way to vent as well as to test if Air France had its social media act together. 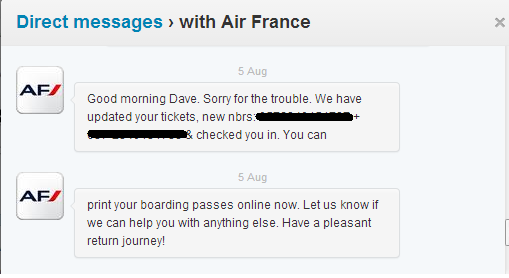 While I wouldn’t give Air France an A in social customer service, I would give them a solid B+. While a bit slow on the first round, they did reach out to me via Twitter direct message, and even tried to call (but after I was “done” for the day on trying to fix the issue). So while they were unable to help on the segment 3 issue (and I’m ergo unable to determine just how empowered they are), they did manage to fix the less serious problems I had checking in on segment 4. I received Twitter direct messages about my problem, they fixed it (overnight), and the even called me the next morning (think: multi-channel service) to make sure I knew they had done so. My friends at the Service Cloud at Salesforce.com figured this out long ago. Customer service organizations need to integrate social media into the contact center, they need to use classical CRM (e.g., loyalty tier, dollars) and social media metrics (e.g., influence, Klout) in order to determine case escalation rules, and then get high-impact and/or high-pain customers to top-empowered agents so they can resolve problems quickly and turn unhappy customers into loyal fans. To be clear, Air France did not do that to me. The modest help with a modest problem did little to offset the frustrations and mishandling of our segment 3 problems. But it was nevertheless encouraging to see that, in social media support at least, they were taking a few steps in the right direction. Some of the best customer experiences I have had in my life were in France and largely uncorrelated to price/cost. Yes, the Tour d’Argent has stunning service, but I’ve also had tremendous experiences at tiny country bistros or cafes. The net result of which was (a) a ruined afternoon the last day of our vacation, (b) several hours on the phone with Air France / Delta, (c) paying about $1/min for those several hours, (d) numerous attempts at blaming us for what was clearly an airline error, (e) a large amount of frustration including the obligatory argument with my spouse, (f) a failure to honor our reservations for 4 of the 6 people in our group on segment 3 of our flight, routing them on another airline to another airport, (h) doing the prior point despite ultimately having empty seats on the aircraft, (i) uncompensated downgrades from premium economy to regular economy, and (j) several more hours wasted when problems repeated themselves on the check-in for segment 4, the final return segment. Air France never actually notified us of this change. We noticed it only after a new person joined our group, bought her ticket on the same flights as we had, and then we discovered the discrepancy. We then called Air France, were assured that everyone had been transferred back to the 2 PM flight, now flight 97, received multiple email confirmations that this was the case, only to discover on trying to check-in that flight 97 was “sold out” and that half of us had no reservation whatsoever and half were on flight 99 at 8 PM. While I think this is now discontinued, back in the 1990s they had a really weird configuration where seats on the right side of the plane could slide their arms towards the middle creating a 2-3 configuration on what’s normally a 3-3 plane. Ergo, the lucky folks on the right actually got wider seats for their money whereas those on the left got nothing. Lest the relevance of this not be obvious, we were paying premium economy in conjunction with our business class long-haul segments and, due to my size, I really appreciate, need, am willing to pay for, and indeed paid for a larger seat with more legroom and/or the ability to get a bulkhead or exit row. Having your reservation nuked and squeezed back in at the last minute is the recipe to get seat 29B which is where, indeed, they put me. I believe that United has been moving in this direction for the past several years.